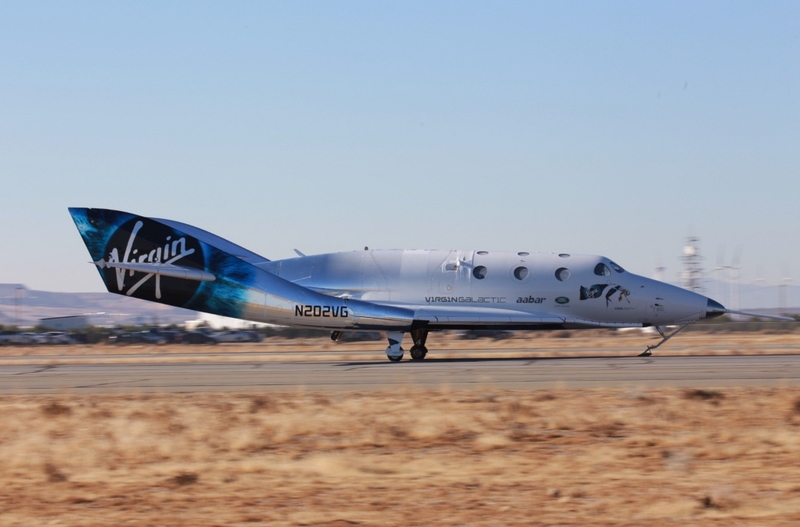 Virgin Galactic’s SpaceShipTwo has moved into powered flight testing. The test comes early in the 2018 campaign, as VSS Unity was put through her paces with several unpowered glide tests and landings. Thursday’s powered flight – with a partial duration burn – was the first time since the loss of VSS Enterprise in 2014. Virgin Galactic hasn’t performed a powered flight since October 31, 2014, when VSS Enterprise experienced a catastrophic failure mid-flight. The tragic accident resulted in the death of one test pilot and severely injured another. However, Virgin Galactic has made significant progress over the last year, and powered flights are expected to resume shortly. The crash of VSS Enterprise in 2014 was a massive setback. The program was already years behind schedule, and many wondered if it could recover from the disaster. Fortunately, the cause was not a design flaw with the hardware, and thus no major design changes were necessary. An NTSB investigation into the accident concluded that a pilot prematurely deployed the feathering system on the spacecraft. The system is used to increase drag during reentry. Many experts heavily criticised operator Virgin Galactic and manufacturer Scaled Composites for not having a fail-safe in place to prevent an early deployment. In response, a fail-safe was implemented, and a program-wide safety review was conducted. 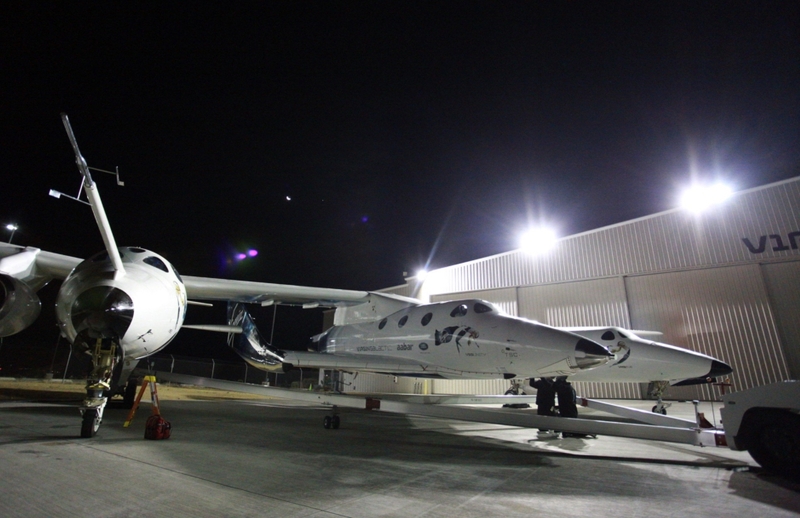 With the loss of VSS Enterprise, SpaceShipTwo testing came to a halt until a replacement spacecraft was ready. In February 2016, Virgin unveiled a new SpaceShipTwo named VSS Unity. This was the first spaceplane constructed in-house by The Spaceship Company, a sister of Virgin Galactic. Over the ensuing months, VSS Unity performed a series of captive carry tests. In December 2016, Unity began the glide testing phase and closed out the year with two successful glides. Ahead of Thursday’s test, a total of six glide tests had been completed. August 2017 test flight – photo Virgin Galactic. Before Thursday’s test, an August 4th, 2017 flight was classed as a dry run for rocket-powered flights. The company noted that for the first time, “all [of VSS Unity’s] principle propulsion components [were] on-board and live.” The only exception was that the vehicle did not have a CTN (Case-Throat-Nozzle). Instead, 1,000 pounds of water took its place. The water shifted the spacecraft’s center of gravity towards the back of the spaceplane. 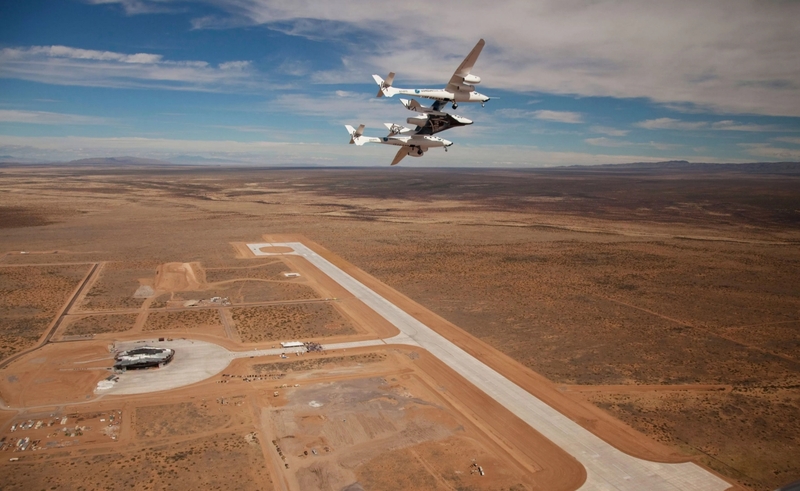 Virgin Galactic is practicing gliding with various centers of gravity. Afterall, in the event of an abort, the vehicle would have to return with propellant still on-board. While Virgin Galactic was rather quiet for the remaining portion of 2017, it did have two notable accomplishments. 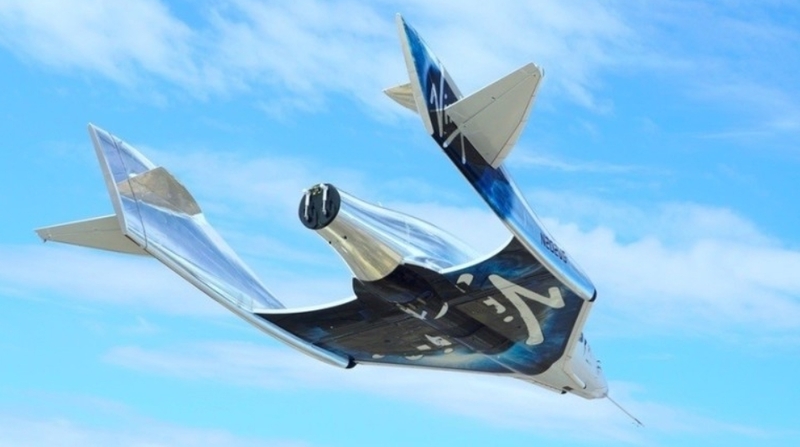 First, the FAA approved a revision to Virgin Galactic’s Commercial Space Transportation License. The revised license allows for SpaceShipTwo to perform flights out of Spaceport America in New Mexico. It previously was only allowed to fly out of the Mojave Air and Space Port in California. Additionally, Virgin announced that the Kingdom of Saudi Arabia would invest $1 billion across the Spaceship Company, Virgin Orbit, and Virgin Galactic. If approved, the deal will help finance the SpaceShipTwo program. In early 2018, Virgin Galactic wrapped up its glide tests before moving ahead with the much anticipated rocket-powered tests. VSS Unity is propelled by a hybrid rocket engine called RocketMotorTwo. The engine uses a liquid nitrous oxide oxidizer. For propellant, the engine was originally designed to burn rubber-based hydroxyl-terminated polybutadiene (HTPB). Interestingly, in 2014 Virgin Galactic announced that they were switching to a plastic-based thermoplastic polyamide for better performance. The plastic fuel made its debut on the disastrous VSS Enterprise flight. While the propellant was not to blame for the accident, SpaceNews reported a year later that Virgin Galactic opted to switch back to the original fuel. This change came after additional test firings at Galactic’s Mojave test facility. Therefore, the upcoming powered test flights use HTPB. The tests see WhiteKnightTwo lift VSS Unity to an elevation of approximately 50,000 feet. Shorty after release, Unity ignites its engine and begins a rapid ascent. This test – albeit a partial burn for this first powered flight – went to plan for pilots Mark “Forger” Stucky and Dave Mackay. During operational flights, the burn will last a little over a minute. However, just like it did with the VSS Enterprise testing, Virgin Galactic will use an incremental approach, rather than going for a full duration burn straight out of the gate. Over the course of the burn, the engine’s thrust will slowly decrease. This will offset the reduction in air resistance and keep the G-forces reasonably comfortable for the people on-board. Once the engine cuts off, the spacecraft will be in a weightless environment. VSS Unity will coast the rest of the way to the apogee. Then, it will begin its descent and prepare for reentry. To reenter the Earth’s atmosphere, SpaceShipTwo uses a system called “the feather.” The feather is when the spacecraft raises its wings to increase drag. As Will Pomerantz, Virgin Galactic’s former VP of Special Projects explains, the additional drag will cause the vehicle to act like a Badminton shuttlecock and naturally orientate itself into the correct position. Regarding the apogee, Unity was initially designed to exceed the Kármán line (the internationally recognized boundary between Earth’s atmosphere and space at 100 kilometers in altitude). However, the spacecraft is no longer capable of doing so. Galactic’s original plan was to use VSS Enterprise as the test vehicle for the program. However, when that spacecraft was lost, VSS Unity was tasked with picking up the slack. As a result, Unity was fitted with the additional hardware necessary for testing. The added mass reduces the maximum apogee to around 80 kilometers. 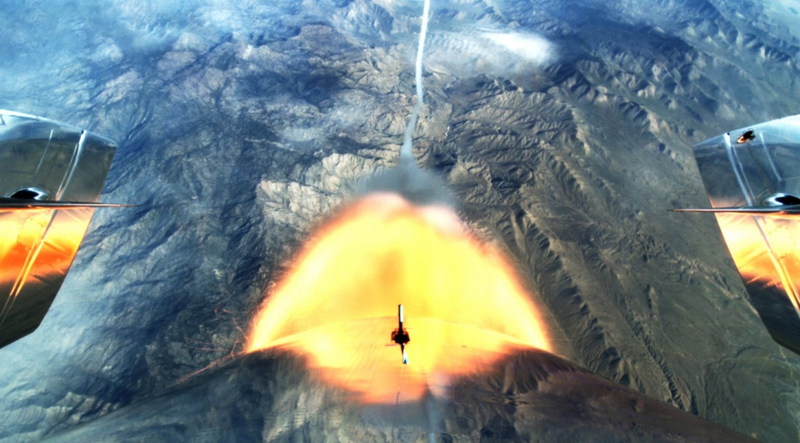 While you shouldn’t expect to see the Kármán line exceeded during rocket-powered tests, Virgin Galactic is confident the weight can be reduced after testing is complete.